Just like fashion, hairstyle trends come and go. That faux-hawk you're sporting? So 2003, bro. Why not get an undercut? While we're on the tail end of the trend, there's still time to get those sides shaved. Smooth and just a little bit edgy, this style which originally rose to prominence in the 1940s has two distinct features: it's incredibly short on the sides and remarkably long at the top. We like it because it can be styled and cut in so many different ways such as these five below. Check them out—and give these a spin at your next trip to barbershop! The sides are short but not shaved away completely while the front is kept in a slightly messy side swept manner. The style looks great on men with prominent cheek bones and a big forehead as the attention-grabbing bangs keeps the focus away from the said facial features. A fusion of the two big trends in men's hairstyles today, the undercut and the DiCaprio-approved man-bun. The biggest challenge here is having the patience to grow your hair to a length in which you can actually tie it. And while you're at it, match it with some facial hair. David Beckham, the Originator Of Many Cool Hairstyles, has been embracing this style for a while now. The name of the game is the same: short sides, long top. 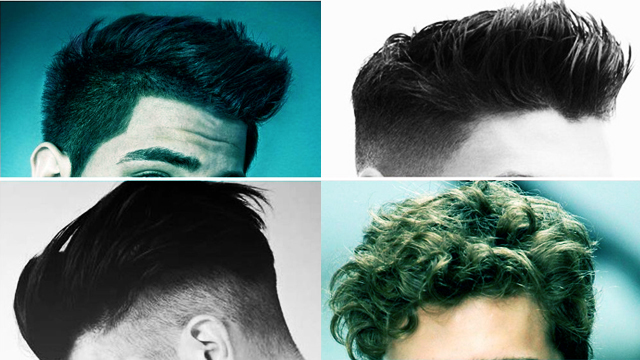 But unlike most undercut styles, the sides are soft and textured and not shaved all the way to the scalp. The top features volume but isn't swept back hard with gel and stays rather soft and bouncy. Works best with wavy hair. Feeling edgy? The top length can be as long or short as you like, so the big thing here are the sides which are etched out. Not for everyone, but if you're young and are looking to grab some attention (and want to someday show people that you once went through this phase), this is the style to choose. Get your hair game on, bro!